Efforts to deepen the ongoing industrialisation drive of the Governor Godwin Obaseki-led administration received a boost on Thursday in Benin City, the state capital, as development experts met to review the Edo State Industrial Development Policy. Welcoming stakeholders to the state’s ‘Industrial Policy Validation Workshop’ Obaseki noted that since he assumed duty, his focus has been on driving holistic development through policies that would engender sustainable economic growth. He urged the workshop participants that his administration is committed to developing a modern state where citizens will be empowered through initiatives that will prioritise employment creation, skills acquisition and entrepreneurship. Obaseki, who was represented by his Special Adviser on Economic and Development planning, Mr. Joseph Eboigbe, maintained that the ongoing reforms in all sectors of the state were designed to eliminate barriers in the ease of doing business. He assured that his administration is developing a modern state where citizens will be empowered to become employers of labour, adding that the state is well on her way to becoming a reference point in creating young entrepreneurs. Dr. Omo Aregbeyen, one of the experts working on the Edo State Industrial Development Policy, described the industrial sector as a key driver for increasing growth rates, generation of enough employment opportunities and sustainable economic growth and development. The Commissioner for Wealth Creation, Employment and Cooperatives, Emmanuel Usoh, commended participants for their support for the government and urged them to produce a framework that will guide the state in her journey to becoming one of the richest states in the country. L-R: Coordinator, Edo State Exporters Cluster, Rhone Peters; representative of Edo State Governor and Special Adviser to the Governor on Economic and Development Planning, Mr.Joseph Eboigbe; Vice Chairman, Edo/Delta Manufacturers’ Association of Nigeria, Engr. 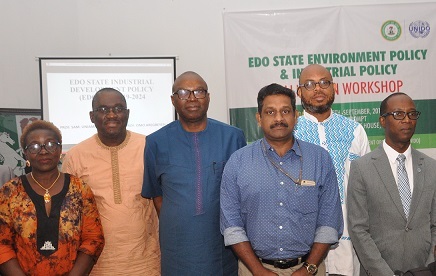 Udensi Okwara; Industrial Coordinator, Okomu Oil Palm Plc, Leonit Shaji; and National Programme Officer, United Nations Industrial Development Organisation, Dr. Rueben O. Bamidele, at the Edo State Industrial Policy Validation Workshop at Government House in Benin City, on Thursday, September 13, 2018.